John Russell was a cofounder and proactive member of BANK between 1991 and 2000 throughout its assorted incarnations, group shows and publishing of a tabloid-style satirical magazine. 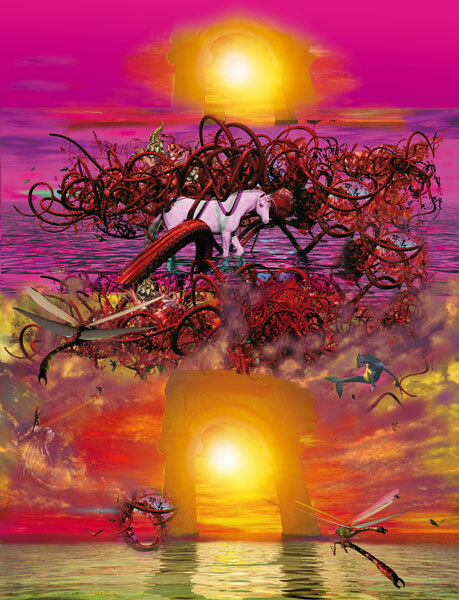 Much of what Matthew Collings described in Art Crazy Nation (2001) as BANK’s “surly, self-destructive, self-conscious, introspective attitude - combined… with critical intelligence and a flair for spotting weaknesses in the art system”, persists in Russell’s wide-ranging post-BANK solo works, from his intellectually intense writings to grand hallucinogenic vistas in backlit digital prints on vinyl. 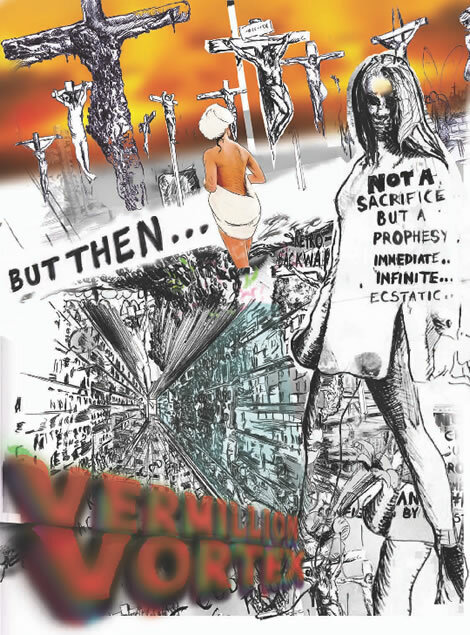 In now addressing the visual-verbal interplays of comics, Russell has developed them into an arresting short ‘drawn film’ for Art Review magazine entitled Vermillion Vortex (2010), viewable above. He largely shuns animation effects, aside from a few pans, zooms or sequences such as water in motion, in favour of a flow of dissolving, sometimes overlapping drawings, mainly kept raw and vivid, some laced with sinister Psycho-style subliminal flashes. He intersperses this image stream with bursts of narrative texts in bold capitals, some balloonish, graffiti-style or aggressively hand-drawn in marker-pen. “I was interested in the potential of drawing and the phrasing of comics,” says Russell. “More specifically, in a kind of cinematic phrasing and the way that a still image can stand in for a scene. Most of the scenes are in fact a kind of minimally animated still. Anime plays on this, as do comics, in the gap between frames.” Neither a comic nor an animation in their conventional senses, and perhaps closer to the halfway hybrid of ‘motion comics’, Russell’s film demands to be read as much as to be watched - as well as listened to, with the soundtrack similarly dissolving music and voiceovers. The result can be experienced as a time-based audiovisual piece like most animated films, but equally the pause and mute buttons let the viewer/reader/listener control it as in a comic. 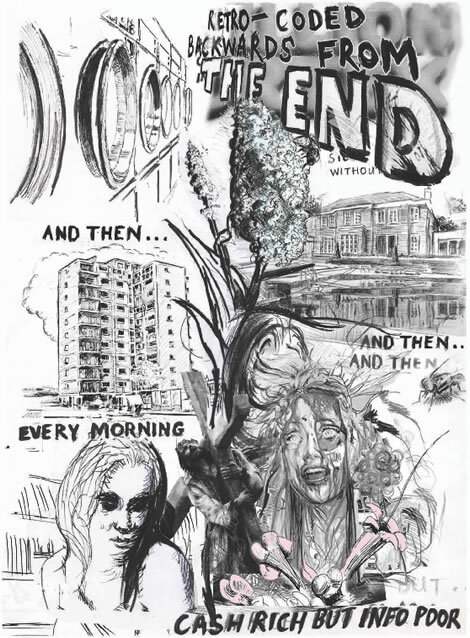 Russell suggests that his Strip for the November 2010 issue of Art Review magazine serves as “a kind of trailer for the film”, but unravelling in reverse, starting with the ending. As the title implies, Vermillion Vortex ‘climaxes’ in a blood-red maelstrom, contrasting the antiseptic soullessness of the main setting nearby with expanses of multiple, rotting Golgothas. In preparing this article for Art Review magazine, John Russell kindly answered some further questions by email. Coming from other practices, for example writing text or making large, rich, complex single images, how did you feel about tackling the media of comics? I have read a lot of comics, in particular I was a fan of 2000AD, not very rarified taste perhaps. I was interested in using drawing as a way of standardising a series of images. I tried to storyboard a film using googleimage (what a wonderful thing that is) to find images and sites like Getty Images. I also used images/drawings I had produced over the last few years. The story was something I wrote a few years ago but in its earlier incarnation it was a reverse-werewolf story - the idea that a dog turns into a man and kills people. But when I started working on the animation I liked the less dramatic parts of the story. 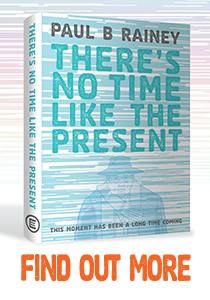 Having the “end of the world” as the conclusion was useful because it helped me keep the story down-beat. In fact I’d like to carry it on further at that pace at some point. 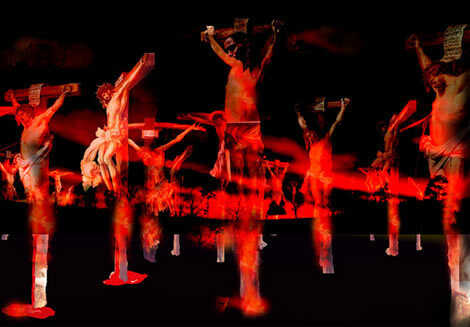 It’s a powerful, unsettlng piece, its title suggesting a blood-red maelstrom? Yes, an event of some kind, some kind of transformation (for better or worse) that requires dramatic change. In some ways your film is closer to a ‘motion comic’, a way of fairly minimally animating a comic, through pans, zooms, small moments of ‘flash’ animation, and added sound of course. Are you aware of these? No, but I am aware of motion graphics and I am very interested in animated gifs and how they work on the web. The original idea was to make a story by linking a series of animated gifs. I liked the urgency of your bubbly lettering - it’s a reading as well as viewing experience, so really more a hybrid of comics and animation? Yes, I thought that. That’s why I varied the writing/typography and the time allowed to read the text, sometimes too long, sometimes too little time to read. I can imagine Vermillon Vortex working as a book, allowing reader/viewer to take the time they choose on each image. Would that appeal to you or do you want the largely imposed duration of film? I did like the imposed duration. I like the way it disrupted the way you viewed things, and the way you could play with attention spans and expectations. I spent so much time on the film, I found it difficult to translate it to the printed strip in fact. That’s why I went for the trailer format in fact. How planned, or how spontaneous, was Vermillion Vortex’s creation? I spent a long time drawing and editing. As the work developed, it changed format from a series of linked webpages/animated gifs to a film and the story changed to exclude the most story-like aspects. I became interested in The End both as both a structural device and an idea. I was partly thinking of those short strips you would get in Marvel comics and Future Shocks in 2000AD, where cataclysmic events were described with reference to a single character not usually featured in the comic - you know the ones I mean. There was something abrupt about the stories that was carried through by the drawings. The drawings somehow surfed over the various implausible aspects of the storyline. I like that effect. This article was published in the November 2010 issue of Art Review magazine.